The hottest ticket in tech is an invitation to a banal South Florida business park, indistinguishable on the outside from countless other office buildings that dot America’s suburban landscape. Inside, it’s a whole different story. A different reality, in fact. Humanoid robots walk down the halls, and green reptilian monsters hang out in the lounge. Cartoon fairies turn the lights on and off. War machines, 75 feet tall, patrol the parking lot. Even the office equipment does the impossible. The high-definition television hanging on the wall seems perfectly normal. Until it vanishes. A moment later it reappears in the middle of the room. Incredibly, it is now levitating in midair. Get as close as you’d like, check it out from different angles. It’s 80 inches diagonal, tuned to ESPN–and there is nothing holding it up. The TV looks real, but it is not. All these wonders are illusions, conjured into being through the lenses of a “mixed reality” headset–the arcane invention of the startup called Magic Leap. Like any good magician, founder and CEO Rony Abovitz, 45, keeps his cards close to his chest. Magic Leap has operated in extreme secrecy since it was founded in 2011. Only a few people got to see its technology, even fewer knew how it worked, and all of them were buried under so many nondisclosure agreements that they could barely admit the company existed. Yet massive amounts of money were flowing down to Dania Beach, Florida, a town of 30,000 just south of Fort Lauderdale. To date, Magic Leap has raised nearly $1.4 billion in venture capital, including $794 million this past February, reportedly the largest C round in history. Seemingly every blue-chip tech investor has a chunk, including Andreessen Horowitz, Kleiner Perkins, Google, JPMorgan, Fidelity and Alibaba, plus there’s backing from less conventional sources such as Warner Bros. and Legendary Entertainment, the maker of films like Godzilla and Jurassic World. Magic Leap was valued at $4.5 billion in its latest round of financing. If Abovitz has held on to just 22% of the company–which he denies– he’s a billionaire. That cascade of money sparked strange rumors within tech circles: Magic Leap was doing something with holograms, or with lasers, or had invented some reality-warping machine the size of a building that would never, could never, be commercialized. The lack of hard information further fueled the whispers. Magic Leap, after all, has never released a product. It has never given a public demonstration of a product, never announced a product, never explained the proprietary “lightfield” technology that powers its product. Magic Leap’s innovation isn’t just a high-tech display–it’s a disruption machine. This technology could affect every business that uses screens or computers and many that don’t. It could kill the $120 billion market for flat-panel displays and shake the $1 trillion global consumer-electronics business to its core. The applications are profound. Throw out your PC, your laptop and your mobile phone, because the computing power you need will be in your glasses, and they can make a display appear anywhere, at any size you like. For that matter, they can make anything appear, like directions to your next meeting, drawn in bright yellow arrows along the roads of your town. You’ll be able to see what that new couch you’re thinking of buying looks like in your living room, from every conceivable angle, under every lighting condition, without leaving your home. Even the least mechanically inclined will be able to repair their automobiles, with an interactive program highlighting exactly which part needs to be replaced and alerting you if you’re doing it wrong. And Magic Leap is positioned to profit from every interaction: not just from the hardware and software it will sell but also, one imagines, from the torrent of data it could collect, analyze–and resell. “It’s hard to think of an area that doesn’t completely change,” Abovitz says. YOU HAVE LIKELY TRIED virtual reality–Sony, Google, Samsung and Facebook have all debuted VR products in the past 12 months. VR is an immersive computer-generated simulation, now used mostly for videogames, whereby VR headsets mask and replace the real world. You may have also tried augmented reality, in which digital content is overlaid on a physical environment. One of the biggest digital fads of 2016 made AR mainstream: In July mobile app developer Niantic released Pokémon Go, a game that uses smartphone cameras to make animated monsters appear to exist in the real world–or at least on your phone’s screen. Neither a VR game nor Pokémon Go can do what Magic Leap’s “mixed reality” does. VR takes you to another place. AR can make a Pikachu appear in your living room. Mixed reality keeps you where you are–and makes that Pikachu come to life. How does it do it? The centerpiece of Magic Leap’s technology is a head-mounted display, but the final product should fit into a pair of spectacles. When you’re wearing the device, it doesn’t block your view of the world; the hardware projects an image directly onto your retina through an optics system built into a piece of semitransparent glass (the product won’t fry your eyeballs; it’s replicating the way we naturally observe the world instead of forcing you to stare at a screen). The hardware also constantly gathers information, scanning the room for obstacles, listening for voices, tracking eye movements and watching hands. As a result, mixed-reality objects are aware of their environment and have the ability to interact with the real world. On Magic Leap’s hardware a Pokémon might escape capture by ducking behind your couch or, assuming you live in a “smart” home, turning off your lights and hiding in the dark. In one of its demos the Magic Leap team shows off a computer-generated “virtual interactive human,” life-size and surprisingly realistic. Abovitz and his team imagine virtual people (or animals or anything else) as digital assistants–think Siri on steroids, except with a physical presence that makes her easier to work with and harder to ignore. Ask your virtual assistant to deliver a message to a coworker and it might walk out of your office, reappear beside your colleague’s desk via his or her own MR headset and deliver the message in person. In a mixed reality world, computing power isn’t confined to a gadget on your desk. It’s something that you can link to any object, real or virtual, giving it awareness of its location, intelligence about its purpose and insight on how you might want to use it. “Think of it as the future state of computing,” Abovitz says, “where the world is your desktop.” First we had mainframes, then PCs, then mobile devices. If Magic Leap has its way, the next generation will be virtual. Email of the future? A virtual desktop, atop an actual desktop, conveyed through Magic Leap’s prototype headset. When he was 11, the family moved to South Florida; he started high school at 13, a year early. After graduation he was accepted at MIT but chose the University of Miami, staying close to home. He received a bachelor’s degree in mechanical engineering in 1994 and a master’s in biomedical engineering two years later–and then he started thinking about Star Wars again. Abovitz cofounded his first company, Z-KAT, in 1997. “I decided to build the medical droid from Star Wars because I thought–I mean, this was the genuine impulse–I couldn’t build an X-wing fighter, because that wasn’t something I could explain to my parents after graduating,” he says. In 2004 Abovitz and several of his cofounders spun out Z-KAT’s robotics group into a new company, Mako Surgical, that made robotic arms to assist doctors in orthopedic surgeries. Demand for the droids was high, and in 2008 the company went public, raising $51 million. Working full-time at Mako and married with a young daughter, Abovitz found an outlet for his creative side in a project he called Hour Blue–his own fictional fantasy world, an alien planet full of fantastic creatures like talking robots and flying whales. In 2010 he started a new company, Magic Leap Studios, to develop the project as a graphic novel series and a feature film franchise. “I was the only employee, and it was literally in my garage,” Abovitz says. “My mom made a piece of canvas with some colored letters on it that said, ‘Magic Leap Studios.’ ” For help on the project, he used some of the cash he’d banked from Mako to hire Weta Workshop, the New Zealand-based special effects and creative-development shop best known for its work on The Lord of the Rings film trilogy, to develop imagery based on his story ideas and flesh out the world. Meanwhile, inspired by sci-fi novels like William Gibson’s Neuromancer and Vernor Vinge’s Rainbows End, Abovitz became frustrated that the augmented and virtual reality he’d read about in fiction wasn’t available in the real world and began thinking about how to make it so. 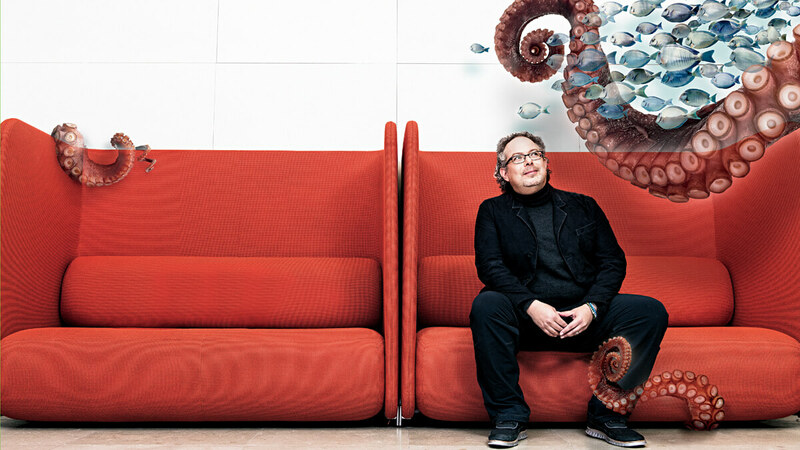 In 2011 Magic Leap Studios changed focus and became Magic Leap Inc., with Abovitz hiring a small team to help him develop this idea of mixed reality. Before long the company had working prototypes. He also knew he was going to need a lot more money. Abovitz had initially funded the company with his proceeds from Mako’s IPO. After Mako was acquired in 2013 by medical device manufacturer Stryker Corp. for $1.7 billion, he invested some of those proceeds as well. Abovitz won’t reveal the exact amount he spent to get the company running (“in the millions” is all he’ll say), but he knew it wouldn’t be nearly enough. In February 2014 Magic Leap announced it had raised more than $50 million in seed funding from private investors. Eight months later the company closed a Google-led $542 million series B funding round. Star Wars predicted it 40 years ago: R2-D2 and C-3PO interact with holograms, following a Magic Leap-Lucasfilm partnership. RONY ABOVITZ DOESN’T SEEM THE captain-of-industry type–unless your model mogul is Willy Wonka. Abovitz lights up like Roald Dahl’s genius chocolatier as he leads a tour through Magic Leap’s new headquarters in Plantation, Florida, a campus more befitting his vision than the nondescript offices 15 minutes away in Dania Beach that he’s vacating. He points out “cool” machines, admires tools and invites guests to climb ladders to check out high-end air filters in the ductwork. He’s friendly and cheery, very casual in speech and attire (often jeans and sweatshirts). People comment on what a nice guy he is as often as they mention his intellect. He’s also liable to get lost in his work. On a recent Friday afternoon he was missing in action half an hour after a tour of the new HQ was scheduled to start–a not uncommon delay but a problematic one, since Abovitz comes from an Orthodox Jewish background and was planning to leave work early to observe the Sabbath. Eventually one of his executives discovered he had been on-site the whole time, sitting in his car in the parking lot, absentmindedly engrossed in a telephone call. Magic Leap broke ground on the new, 259,000-square-foot campus in October 2015 and expects the majority of its current 850 employees to move in before the end of this year. The rest of the workers are scattered in nine offices around the globe, not just in tech hot spots like Silicon Valley and Austin but also in far-flung outposts like Wellington, New Zealand, and Tel Aviv. Some groups are already in place at the new site, including a machine shop and several engineering teams. It’s important to Abovitz to keep critical development teams together as part of an “agile hardware” model, which has allowed the company to produce “literally many hundreds of iterations” of its headset prototype. “Part of why Magic Leap can iterate so fast is because we have all the right people in the right places,” Abovitz says. The company is also building manufacturing facilities on the Plantation campus. “This is the most spaceshippy part of Magic Leap,” Abovitz says as he leads a group into the production line areas: a series of long, self-contained, modular bays lined up like submarines in a port. Each line can be activated as needed, ramping up production from thousands of units a year to more than a million. Abovitz wants Magic Leap to stay in Florida; one of the benefits of manufacturing there is that it allows the company to keep its secrets. If it were headquartered in Northern California, that would be nearly impossible, given Silicon Valley’s job-hopping culture and well-lubricated rumor mill. Of course, he would also have an easier time hiring, but Magic Leap’s technology has been a strong draw, pulling people in from the Valley and other tech hubs. “We’re bringing a crazy amount of very capable high-end engineering and manufacturing tech talent into Florida,” he says. NATURALLY, ABOVITZ ISN’T THE ONLY entrepreneur who sees opportunity in this field. In just the past 12 months, $2.3 billion has been invested in virtual reality and augmented reality, as venture firms follow the money, according to Digi-Capital. And International Data Corp. says that worldwide revenues for the augmented and virtual reality market will grow from $5.2 billion this year to more than $162 billion in 2020. With that kind of growth, all the big names are scrambling to get a piece of the action. Google already dipped its toes into AR in 2013 with its ill-fated Google Glass, a pair of spectacles that made a virtual computer screen appear to float in front of the user. The project stalled in beta amid privacy and safety concerns, but Google’s investment in Magic Leap indicates its ongoing interest. “We knew from some of our earliest discussions with Rony and the team that we wanted to help them accelerate their vision into reality,” says Don Harrison, vice president of corporate development at Google. Apple is working on AR as well, but it’s unclear whether it is developing its own headset or adding capabilities to the iPhone. Silicon Valley startups like Meta (which has raised $73 million) and Atheer (a reported $23 million) are working on their own AR headsets and would presumably be natural acquisition candidates if they are successful. So now that it has a production line, what’s Magic Leap’s timing for entering the market? “Soon-ish,” says Abovitz, coyly. He’s also reticent about what the headset will cost. “Not a luxury product,” he finally offers. Still, with Microsoft expected to release the consumer version of its HoloLens augmented reality headset sometime next year, it’s clear that Magic Leap’s gear must get onto shelves in the same window or it will risk losing ground to its biggest competitor. And with preorders for Meta’s headset priced around $1,000, expect Magic Leap’s new goggles to be in the same four-figure ballpark. Eventually Magic Leap sees its greatest impact in business applications, especially medical imaging and retail (imagine “trying on” garments at home, seamlessly). But as with most technologies, entertainment offerings will lead the way. Magic Leap is developing much of its content in-house and has already hired several well-known videogame designers, cartoonists, artists and writers. Neal Stephenson, author of Snow Crash, a seminal 1992 novel about virtual reality, is Magic Leap’s chief futurist, working out of the company’s Seattle office on an undisclosed game. Other content is coming from Abovitz’s allies at Weta Workshop, which operates a 25-person lab with Magic Leap in New Zealand. Its first project, Dr. Grordbort’s Invaders, is an action-oriented game set in a steampunk alternate universe: The player wields a ray gun and fights off evil robots that seem to break through the walls of his or her living room and fly around the house. In June Magic Leap also announced a strategic partnership with ILMxLAB, the immersive entertainment division of Lucasfilm, and opened a joint research lab on Lucasfilm’s San Francisco campus. “It’s like being in the earliest days of cinema,” says Vicki Dobbs Beck, the head of ILMxLAB. The collaboration has already produced several mixed-reality experiences set in the Star Wars universe, including one revealed at the time of the announcement that features the droids C-3P0 and R2-D2, and another, as-yet-unrevealed action sequence set in The Empire Strikes Back’s iconic Battle of Hoth. And it has brought Rony Abovitz full circle. The man who became an entrepreneur because he secretly wanted to build X-wing fighters is now actually doing it.